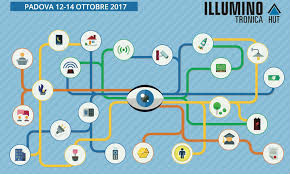 ILLUMINOTRONICA is a unique exhibition event dedicated to smart homes and smart cities. This event allows its participants to become familiar with latest trends in the use of information and communication technologies in everyday life. Many manufacturers and distributors of integrated systems and automation experts will come to Padua, Italy. Numerous specialist workshops will be held during the fair and will cover, among others, increasing safety, optimising lighting systems, and smart home automation. We will be waiting for you at our stand A20! 12–13 October 2017: 9.00 a.m. – 6.00 p.m.
14 October 2017: 9.00 a.m. – 6.00 p.m.